Let me start by telling you that I had an amazing Black Friday! I got up at 4:00 AM, met a couple of friends at my favorite comic book store Alternate Reality (3149 W. 111th St. Chicago, IL. 60655), took advantage of some amazing deals, went out for breakfast, came home for a nap, went with the same couple of friends to my second favorite comic book store Amazing Fantasy (20523 S. LaGrange Rd. Frankfort, IL. 60423), took advantage of some other amazing deals, and I was home by 10:45 AM…broke and happy. Here’s a pic of just the comics I bought in those few hours. It looks like a ton, and it is, but the deals were so good that I was only spending about a buck an issue, and you can’t beat that. So, this week, I’m going to do something new…I’m going to review single issue series comics that are currently running. The Comic Book Teacher and I generally do graphic novels or we try to switch it up with social-comics commentary and fun lists, but this week, from me, you get a wide variety of titles that you can pick up at your local comic book store right now. 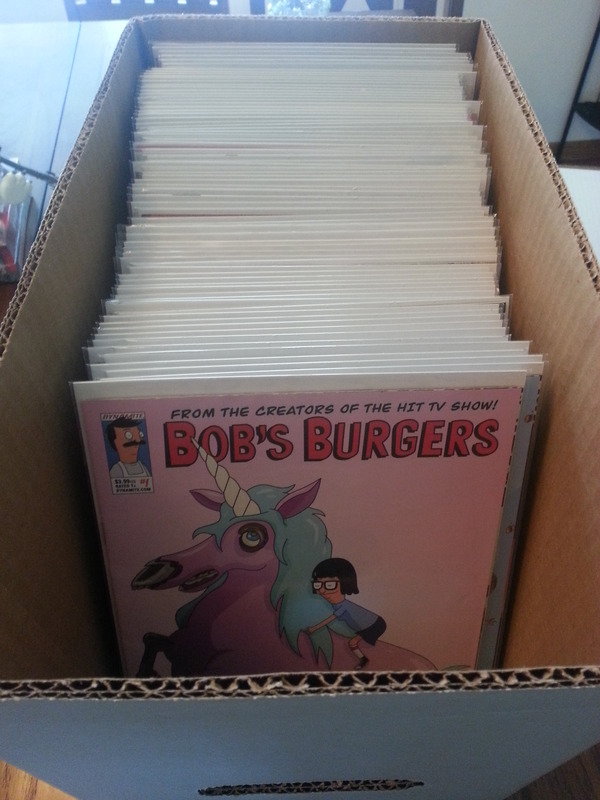 I’m going to start with a comic that I would have never bought unless it was a dollar: Bob’s Burgers. I love the show, but in the past, I’ve had a hard time purchasing comics based off of television shows, but I love Bob’s Burgers, so why not? For $4.00, I picked up the first four issues. They are made by the peeps responsible for the show, and they are good…if you are a fan of the show. If you are not a fan of the show, you will be lost reading these comics, and they will not be nearly as entertaining. Each issue contains a variety of about five different segments, and for those of you that read issues, you know that an issue is fairly short. So are these segments. The segments cover a wide range of material: Tina’s fan fiction about the Equestranauts or Battlestar Galactica; “Letters From Linda” where readers are exposed to letters written by Linda Belcher to various companies; and even Louise’s ideas for different burger specials, you know, the ones that appear on the chalk board in the restaurant. If you do not watch the show, this information will be foreign to you, but as a fan, these comics offer further character/world expansion that really pays off. 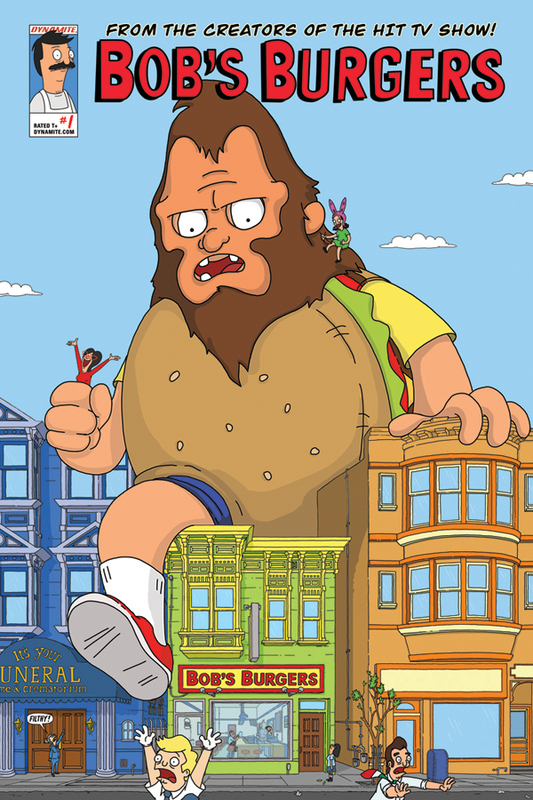 I have always known about the Futurama and Simpsons’ comics, but I have always turned away from them, assuming that they would be dumb and not nearly as engaging as the shows, but after reading the Bob’s Burgers issues, I have to admit that I’m pretty excited to start checking them out, especially Futurama since the show has ended, and I’m really missing those characters. That Futurama/Simpsons cross-over episode a few weeks ago really had me missing Fry, Bender, and the rest of the gang. As far as the classroom goes, I don’t think you would use the Bob’s Burgers issues in your instruction unless you gain some sort of inspiration from the issues’ layout and somehow transpose that into your pedagogy, but if you know folks that are fans of the show, these issues are great to share and enjoy. They are what many of us used to assume comics were at one point: mindless fun. However, if you seek out these issues because you are a fan, you will get a few genuine laughs from them, and they will satisfy your Bob’s Burgers fix while the show is in hiatus. I’ll be bringing you titles all week, so check back daily! I bought a lot of comics this weekend, and I look forward to sharing my thoughts about them with you.